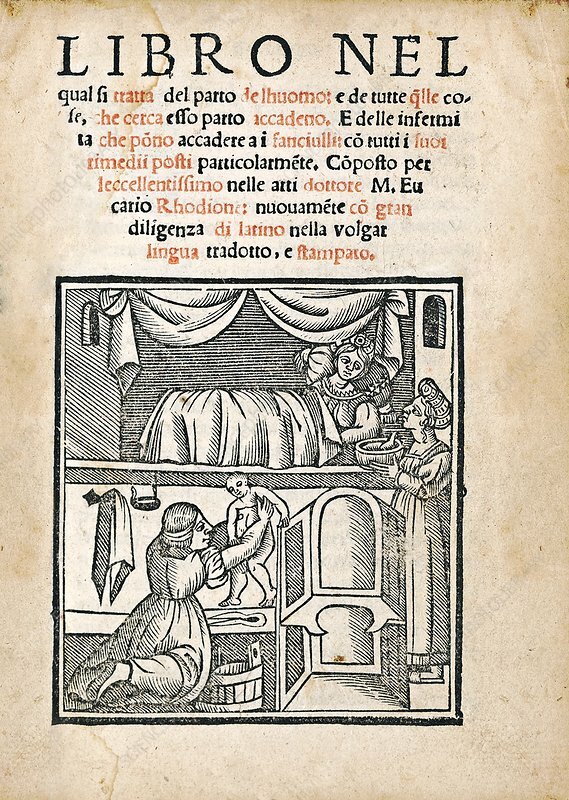 Libro nel qual si tratta del parto de l'huomo (1538). Title page of a 16th-century edition of a work on childbirth by German physician Eucharius Rosslin (c.1470-1526). The illustration shows midwives assisting at a birth, with a birthing chair at lower right. Rosslin's works helped improve midwifery standards that had been contributing to high rates of infant mortality. His writings were translated into many languages. His original work was written in 1513 in German under the title 'Der Rosengarten' (The Rose Garden). This Italian edition ('Book ... Venice, giving an Italian form of his name (Eucario Rhodione).